OUTLAW EAGLE MANUFACTURING :: View topic - Boat the Brazeau 2014!! Posted: Wed Jul 30, 2014 11:27 am Post subject: Boat the Brazeau 2014!! 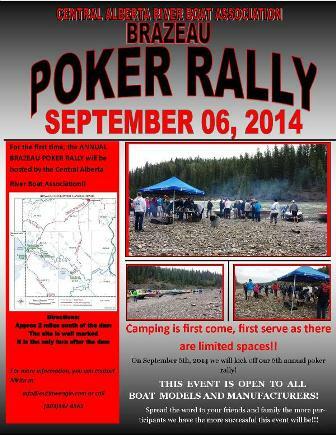 For the first time, Central Alberta River Boat Association will be hosting the Boat the Brazeau Poker Rally, September 6 2014! We can't wait to have a bigger and better event this year, and hope to see you all out there! Be sure to share with your friends, lets make this the best year we can! We will let you know all the information in the following week! Just be sure to save the date! !